Let me begin by saying that my vacation to Hawaii is on a lot of my top ten lists--best vacations, happiest places on earth, most romantic. It was a wonderful second honeymoon. Beautiful. It was Hawaii. Trying to narrow down all that Oahu has to offer to a top ten list is almost impossible. Please note that when I went to Oahu, I was ten weeks pregnant. Consequently, I did not scuba dive or take surfing lessons. If I had, they would probably be 1 and 2 on my list. I also did not get a chance to try a helicopter tour or swim with dolphins. They too would probably have made my top ten list. Despite those shortcomings, I think you will find my top ten list a pretty impressive vacation. This is really for my husband. He is a BIG movie fan. Kualoa Ranch is Hawaii's Hollywood. Jurassic Park, Lost, Hawaii 5-0, and many more movies and t.v. shows were filmed here. Hop aboard a tour bus and drive through the ranch with plenty of stops for pictures. They also have horse riding and other activities. For those who do not want a dharma t-shirt, there are several other tourist options including Dole Plantation's pineapple maze, 'Iolani Palace, hiking Diamond Head Crater, or Bishop's Museum. Garlic heaven. Giovanni's is a graffitied truck with open air tables and a line that stretches to the parking lot. Yes, it is that good. The shrimp is fresh and generously seasoned, served with a side of garlic rice. I craved this for weeks after leaving Hawaii. My only regret is that we didn't eat here more often. The Aloha Stadium Swap Meet is miles of shopping bargains. For a fraction of what you will spend shopping in Waikiki, you can pick up all your souvenirs including Hawaiian shirts, bongo drums, tiki monsters, jewelry, and everything else you can possibly imagine. Husbands beware, your wife can shop for hours here. Located in the heart of Waikiki, this shopping experience is the other bargain spot in Hawaii. Hundreds of carts cluster in an around an enormous banyan tree. My favorite finds were Japanese puzzle jewelry boxes and wooden frog instruments. Be sure to have your bargaining skills ready. Many items can be purchased for around half the original price. Nothing says Hawaii like hula dancers and a pig roast. A must for first time tourists, but pricey enough you may want to skip the next time around. Otherwise, sit back, eat your fill, and enjoy the show. Tropical Paradise. A leisurely mile walk through tropical jungle ending with a swim in the falls (strength of the falls varies by season). The pool is several feet deep, so you must be a good swimmer. It was also fairly cold. But, standing in the falls with my husband--amazing. The jungle is also stunning and filled with beautiful and unusual plants, flowers, fruits, and birds, but no reptiles or mammals. Located on the north end, the Polynesian Cultural Center or PCC is a unique experience. Run mostly by students, the PCC showcases several different Polynesian groups including Tahiti, Samoa, and Hawaii. The talent is exceptional, especially the dancers. Each exhibit is highly interactive and child friendly. 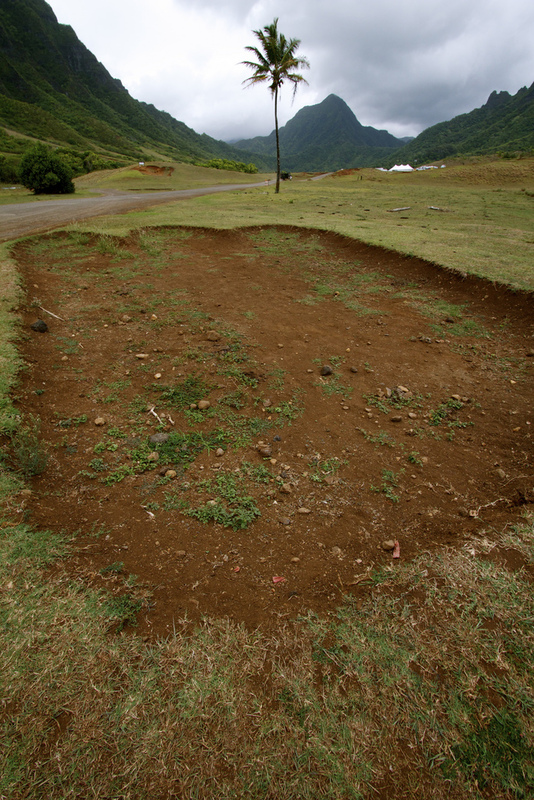 Each area depicts housing, customs, games, dances, and traditions unique to that country. Of the different areas, Samoa is the most amazing. 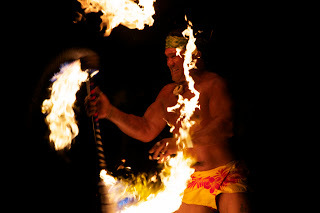 The host climbs a palm tree, shreds a coconut in seconds, and displays a small taste of his fire knife dancing skills. The real excitement comes at night when several Samoan dancers perform fire knife dancing tricks worthy of a Vegas stage. They manipulate fire in the palms of their hands, twirl it on batons, and walk barefoot through it. The cost of this venue is steep but the evening show is well worth it. We visited several beaches all around the island. Some had tide pools with all sorts of sea life. Others were great for a swim. Still others were fun to play in the crashing waves. We spent almost half of each day in the ocean. And we spent most evenings dining and walking along the beach at sunset. I practically lived in my swimsuit. There are all types of water activities including stand and paddle surfboards, traditional surfboards, tube floats, glass bottom boats, and more. Very powerful. The memorial is in the middle of the bay atop of the USS Arizona, one of the sunken battleships whose hull is still visible in the ocean. The experience includes watching a short film explaining the events leading up to the attack, seeing the names of the dead, starring into the depths and seeing the ghost ship still leaking oil. The grounds are expanding with several exhibits and displays to wander through. There are also three other major museums nearby--the battleship Missouri (where Japan surrendered ending WWII), the Bowfin Submarine Museum, and the Pacific Aviation Museum. Because my husband's grandfather served as a pilot in the Pacific, we visited the aviation museum. The life size replicas bring history to a new level. My only regret is we only had half a day to spend at these locations and were unable to tour as long as we liked. One word--snorkeling. I had never been snorkeling. From the time I first put my masked face into the water, I couldn't believe my eyes. It was like being inside an aquarium tank. There were dozens of brightly colored fish swimming all around me. Below me were myriads of coral species. I bought an underwater camera and began snapping pictures. I was practically awestruck. I even saw an eel which actually made me panic a little. This is a must see attraction. Hawaii was amazing--the food, the views, the history, the ocean. I ate more tropical fruit in one week than I usually do in a year. I also swam more in a week than I usually do in a year. And I can't wait to go back. Indeed, Hawaii is very beautiful. Aside from the beach, I love the pineapple plantation. 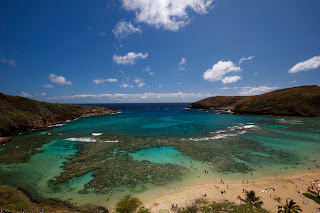 I have been to little grommets, one of Hawaii's famous surfing destinations that is a beginner's course.